Talk to any successful business leader and they’ll no doubt share how their busy schedules and long hours have kept them away from their families. CEOs, professional athletes, government officials, and sales reps all make a huge sacrifice by giving up time with their children. And it seems like the more successful they become, the greater the sacrifice. Like many others, Shivaram and Anjali Kumar were headed toward the top of the elusive corporate ladder where family time is a rarity. But they decided to jump off the corporate track, and in that decision they not only found each other, but they also found an opportunity that enhanced their lives in more ways than one. Kumar and Anjali grew up just a few miles apart in Mumbai, India, but they did not meet until they moved to the United States. They arrived in the same year, Kumar to pursue his masters degree in computer engineering, and Anjali to attend her sister’s wedding. 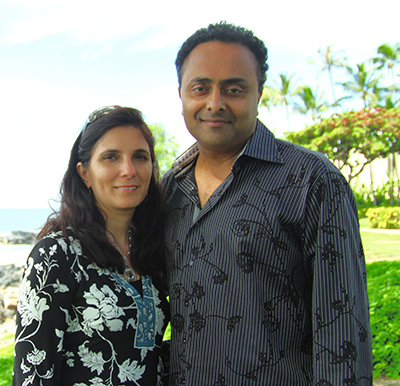 Kumar began a job as a computer consultant, and Anjali stayed in the U.S. to develop a career in the travel field. Only a couple of years into their separate careers, they met at a business seminar, which soon led to a romance and marriage. After their wedding, the couple set very aggressive goals together and focused on their business. They found that they share the same strategies for building a successful business — a strong work ethic, the importance of written goals, and the power of speaking effectively — but also found that they each brought different strengths to the business as well. Kumar is a dreamer and Anjali is determined, confident, poised, graceful and articulate. As a result, their business expanded rapidly and they quickly found a way to enhance their lives in in more ways than one. As they continued to build their business, their dreams would quickly upgrade from simply affording health insurance, to include supporting Kumar’s family back in India, to having a better living standard, and then complete financial freedom. Today they lead a balanced life, with plenty of time for each other and their three daughters, Devika, Tarika, and Ritika. Spending time with their children is a priority for the Kumars. They are very grateful for the security and peace of mind that their business provides, and most importantly for the time they are able to spend with their children. Leading by example, the Kumars want their children to know that they can accomplish anything they set their hearts on. Kumar and Anjali understand the value of helping others, and give back to charities in their local communities. They are especially active in supporting Easter Seals and the U.S. Dream Academy, because of the programs these organizations have developed to meet the needs of children and returning veterans. The Kumars believe that anyone can succeed in business no matter what their upbringing or background, as long as they have a strong dream and willingness to learn and change. They have peace of mind when they see others succeed and feel rewarded watching others grow and improve their lives. They encourage others to dream at every level, and teach them that the best way to predict the future is to create it!